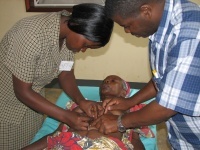 The Pan-African Acupuncture Project trains health care workers in Africa to use acupuncture for HIV/AIDS, malaria and tuberculosis. Have you ever wondered if one person can make a difference in helping soothe the suffering of many? Acupuncturist Richard Mandell wondered that very thing, and what he learned is making a huge difference in the lives of many. In 2001, Richard Mandell, L.Ac., was grappling with reports of the AIDS epidemic in Africa. He began questioning how he could use his acupuncture training to reduce people�s suffering. Mandell had read about a program in Guatemala that trained local health care providers to provide treatment, and used it as a model for Africa. His dream became the PanAfrican Acupuncture Project, a Boston-based non-profit organization that trains health care workers in Africa to use simple and effective acupuncture techniques to treat the devastating and debilitating symptoms associated with HIV/AIDS, malaria, and tuberculosis. Mandell now serves as the project�s executive director. �In a broader sense, our hope is to improve their quality of life, and to do that by reducing their pain and suffering,� Mandell says. Since Mandell and his first team of trainers visited Uganda in 2003, the organization has already trained more than 120 locals, including nurses, medical doctors, midwives, and traditional healers. The PanAfrican Acupuncture Project is planting the seeds of success in Uganda, and the positive impact of this empowering model continues to grow. On a recent trip, six trainers from the United States and Canada taught 34 Ugandan health care workers acupuncture techniques. 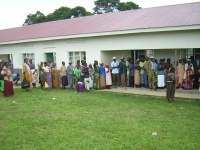 Within two weeks, the locals had treated more than 1,000 people. The program has been so successful that the government of Malawi has requested a program, and Mandell is working with key contacts in Kenya, Ethiopia, and several other African countries. Individuals around the world contribute to the PanAfrican Acupuncture Project, a non-profit 501(c)(3) organization. �People need to know that the money they donate directly reduces pain and suffering,� Mandell says. The project depends on financial donations, as well as supplies and its volunteer trainers. Still wondering if one person can make a difference? Ask anyone involved in the PanAfrican Acupuncture Project. For more information, visit www.panafricanacupuncture.org or call (617) 277-7444.